1. My husband and I have enjoyed many years of bay fishing and river fishing. Once, while fishing for bass on the river, we got caught in a freak thunderstorm—rain, wind, lightning and hail. As we didn’t want to be sitting on the water in an aluminum pontoon boat, we looked for a place to beach with shelter. There were several small islands nearby, a few with summer cottages, so we beached on the nearest. The guy in the house saw us struggling, and motioned us inside. We anchored our boat and hurried after him. After about ten minutes indoors we heard a massive crack directly overhead. Not thunder, but something else. We raced outside to find a large tree had been struck by lightning and dropped onto the roof. Seconds later, my husband spied our boat one step shy of being swept into the river—the storm had ripped our anchor free. Fortunately, he was able to grab it at the last moment and haul it back in, but had the tree not fell we would have been minus a boat. Thankfully, no one was injured and the cottage only had minor roof damage. 2. I was a bit of a rebel in high school and during my senior year led a protest that involved barging into the teachers’ lounge, and demanding that the principal meet my group in the auditorium. There was about twenty of us who cut class, pulled down “no smoking” signs and demanded we be given our own smoking area outside. Remember, this was a looooong time ago, and people didn’t realize how bad smoking was. I was the ringleader of that protest and am still amazed I wasn’t expelled. 3. A number of years ago I attended a business conference in Arizona as part of my day job. My husband went along and we extended our stay for a mini vacation. The conference was held at a resort of villas that included eight suites, each villa with a private pool. Late one night, hubby and I went for a romantic moonlight swim. The place was deserted, no one about. We had the pool to ourselves—right up until a helicopter swooped down, hovered above us, and nailed us in the beam of a high-intensity spotlight. I freaked out, my husband yelled something not very pleasant, and the helicopter took off. We went back to our suite and my husband spied someone prowling around below our balcony. Turns out it was a cop who warned us to stay inside as a convenience store had been robbed several miles away and the armed suspect had been chased to our area. I hate to think if he’d stumbled upon us in the pool! 4. My nickname in high school was Starchild. 5. I grew up with an Italian grandfather who immigrated to the U.S. from Castelleone when he was 28. He was proud of his cultural heritage and taught me to speak Italian when I was just seven years old. Ok, which one ISN'T true?? And for #3, were you guys skinny dipping, per chance? #4 Buah-ha-ha! (Guitar strumming) Where have all the flowers gone, long time passing, where have all the flowers gone, long time ago. #5, can you please teach me how to say stick it up your arse in Italian? That's for my hubby. 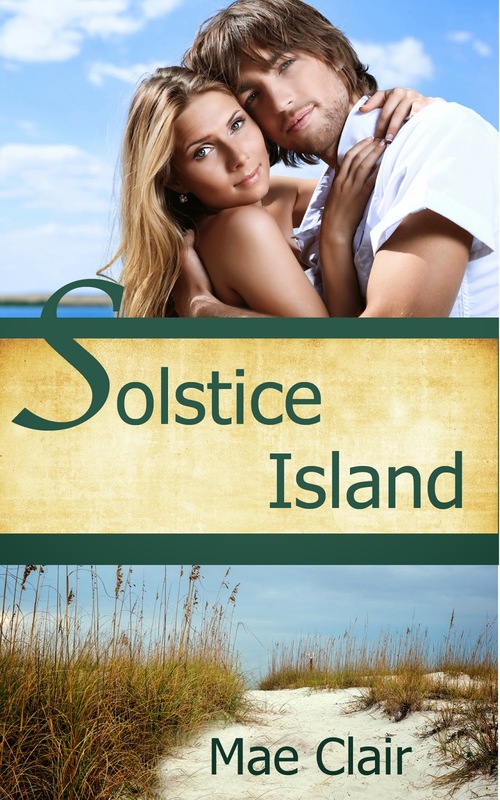 Miss Mae has done a fabulous job with her first indie-publishing of her contemporary romance novella, SOLSTICE ISLAND, from the cover to the formatting, and I am tres impressed. Do check it out, it's high on my TBR list. This adventure romance has all five-star reviews! Oh, Mae. This is hard. You're such a good story teller, I want to pick #1, but I think that's true. I don't think you're nickname was Starchild. I pick #4 as the untruth. CD - I love the "Bueh-ha-ha." Hi Mary! Thanks for popping over. It's a hard one eh? But I just love all the stories the authors dig up. Hi, Mary. Glad you hopped by to guess! Doesn't Cd come up with fun ideas for her guests? I knew I had to become a 'smore (thank you Miss Cd for having me) as soon as she tossed out the idea. As for the untruth . . . I think I'll wait a wee bit longer before divulging which is the untruth (hmm...I wonder if that's like the uncola, LOL). Good morning you nutty ladies. Mae, I love that your Nonno taught you to speak Italian. My father didn't speak any English until he went to school. I had no idea growing up though, because he never spoke Italian to us, other than a few short phrases to tell us to lock the doors, or hurry up. When I was in my 30s I overhead Dad speaking fluent Italian with his cousins. I wasn't happy that I'd missed out on learning a language. As far as which fact isn't true - I'm going to go with #2. I just don't see you as a smoker. Rebel, yes, smoker, no. Am I right? Hi, Gemma. What a great tale about your father. It must have been really hard for him when he first went to school...I can't imagine! How fun! And I hope there's still some of those s'mores around here -- those look yummy! Mae, you're such a great storyteller, I'm not sure which one isn't true -- but it doesn't even matter, because they're all entertaining! I'm feeling a bit peckish, too, could use some chocolate! Thanks for stopping by Donna, and I completely agree. Mae is one heck of a storyteller. Good stories, but I'll go with #2. I'm going with #3 being a fib. When you have a private pool to yourself, all choppers and potential convicts should be off-limits. Lovely stories, all of them. LOL. I know, can you imagine? Sounds like something out of movie! I love the stories, Mae. I reckon number 4 is not true. A pity the pilot spoiled your moonlight swim and I can recall when smoking was allowed in our 6th form college common room. It was like walking into a fog. Hi Daisy, and thanks for popping over! 6th form in the UK is ??? I have no clue which is false but will go with the 3rd story about the robber and helicopter. Interesting post and good, quirky idea by your host! Hi Flossie! Thanks for popping over, and glad you enjoyed it! Hi Heather! I totally agree. Mae is a great storyteller! Can't wait to find out which one she made up! Cd, I have to thank you for a dazzling fun time on your blog. Thanks also to all my friends who popped in to take a stab at my fib. I really enjoyed myself and sharing these memories. My fib is the last one. My grandfather was from Castelleone and came to the U.S. when he was twenty-eight but he never spoke Italian around us. Even my mother didn’t know a word of it. The only time I ever heard my grandfather speak his native language was when he called home to the “old country” and chatted with his relatives over the phone. To this day, I regret I never learned Italian. Dear Starchild (LOL) - it was all my pleasure! Thanks so much for sharing some great memories, and I now I feel I know you all the better!